Accumulating evidence indicates that expression of anaplastic lymphoma kinase (ALK), typically due to t(2;5) translocation, defines a distinct type of T/null-cell lymphoma (TCL). The resulting nucleophosmin (NPM) /ALK chimeric kinase is constitutively active and oncogenic. Downstream effector molecules triggered by NPM/ALK remain, however, largely unidentified. Here we report that NPM/ALK induces continuous activation of STAT3. STAT3 displayed tyrosine phosphorylation and DNA binding in all (four of four) ALK+ TCL cell lines tested. The activation of STAT3 was selective because none of the other known STATs was consistently tyrosine phosphorylated in these cell lines. In addition, malignant cells in tissue sections from all (10 of 10) ALK+ TCL patients expressed tyrosine-phosphorylated STAT3. Transfection of BaF3 cells with NPM/ALK resulted in tyrosine phosphorylation of STAT3. Furthermore, STAT3 was constitutively associated with NPM/ALK in the ALK+ TCL cell lines. Additional studies into the mechanisms of STAT3 activation revealed that the ALK+ TCL cells expressed a positive regulator of STAT3 activation, protein phosphatase 2A (PP2A), which was constitutively associated with STAT3. Treatment with the PP2A inhibitor calyculin A abrogated tyrosine phosphorylation of STAT3. Finally, ALK+ T cells failed to express a negative regulator of activated STAT3, protein inhibitor of activated STAT3. These data indicate that NPM/ALK activates STAT3 and that PP2A and lack of protein inhibitor of activated STAT3 may be important in maintaining STAT3 in the activated state in the ALK+ TCL cells. These results also suggest that activated STAT3, which is known to display oncogenic properties, as well as its regulatory molecules may represent attractive targets for novel therapies in ALK+ TCL. It has been proposed recently that expression of anaplastic lymphoma kinase (ALK)3 defines a distinct clinicopatholological entity within the non-Hodgkin’s lymphoma category (1, 2, 3). The ALK+ lymphomas occur predominantly in children and young adults as a disseminated disease with frequent involvement of extranodal sites. ALK+ lymphomas usually display an anaplastic large cell morphology and express CD30 Ag (reviewed in Refs. 4 and 5). They almost invariably express a T/null-cell phenotype, although rare cases of ALK+ B cell lymphoma have also been described (6). The expression of ALK represents an independent, favorable prognostic factor in all patient age groups (1, 7, 8). However, other variables such as high stage of the lymphoma (7) and the presence of activated cytotoxic T lymphocytes (9) negatively impact on the treatment outcome. Most studies have demonstrated that ALK expression is useful in distinguishing ALK+ lymphoma from other entities such as Hodgkin lymphoma (10, 11, 12, 13, 14, 15, 16, 17, 18, 19, 20) and primary cutaneous CD30+ lymphoproliferative disorders (15, 17, 18, 21, 22), particularly when detected on the protein level by immunohistochemical staining. Expression of ALK, which is physiologically confined to cells of the nervous system (23), results in lymphomas from at least five different translocations involving ALK gene locus on the short arm of chromosome 2 (24, 25, 26, 27, 28, 29, 30, 31, 32, 33). The most frequent is a translocation t(2;5) (p23;q35) that occurs in up to 80% of cases of the ALK+ T/null-cell lymphoma (TCL). It fuses the ALK gene with a gene encoding nucleophosmin (NPM), which is a ubiquitously expressed protein involved in shuttling of ribosomal components between the cytoplasm and the nucleus (34, 35, 36, 37). The resulting 80-kDa NPM/ALK chimeric protein contains the oligomerization motif of NPM fused to the cytoplasmic portion of ALK that includes an intact kinase catalytic domain (38, 39, 40). NPM/ALK is constitutively activated through tyrosine autophosphorylation (41, 42). It has cell-transforming properties as demonstrated in in vitro (41, 42, 43) and in vivo (44, 45) experimental systems. However, the mechanisms of NPM/ALK-mediated oncogenesis remain poorly defined (41, 45, 46). STATs are members of the ubiquitously expressed family of transcription factors activated in response to growth factors and cytokines (reviewed in Refs. 47, 48, 49). Activation of STATs requires phosphorylation of their tyrosine residues either by the receptors that often display an intrinsic tyrosine kinase activity or by receptor-associated Jak/Tyk kinases. The phosphorylated STATs form dimers that translocate into the nucleus and initiate transcription of the growth factor/cytokine-responsive genes. STATs play a critical role in promoting cell proliferation and cell protection from apoptosis. Several members of the STAT family have been identified and designated STAT1 to STAT6. STAT5 comprises two closely related but distinct STATs labeled STAT5a and STAT5b. STAT1 and STAT3 have two isoforms (STAT1 and STAT3 β) resulting from an alternative gene splicing. Here we show that NPM/ALK induces constitutive activation of STAT3 in ALK+ TCL cells. This activation was present in all ALK+ TCL cell lines (4 of 4) and tissues (10 of 10) tested. STAT3 activation was selective because the other six STATs were inconsistently activated in the ALK+ TCL cell lines. In addition, STAT3 became phosphorylated in BaF3 lymphoid cells after transfection with NPM/ALK, but not with an empty vector. Furthermore, STAT3 was constitutively associated with ALK. We also showed that the ALK+ TCL cell lines expressed PP2A phosphatase (50), activity of which was critical for maintenance of the constitutive tyrosine phosphorylation of STAT3. Finally, the ALK+ T cell lines failed to express a negative regulator of STAT3 activation, PIAS3 (49, 51). Biological and clinical implications of these findings are discussed. JB6, SU-DHL1, Karpas 299, and SUP-M2 cell lines are derived from four different CD30+ anaplastic large TCLs and carry the t(2;5) chromosomal translocation involving ALK and NPM genes as documented by cytogenetic, molecular, and/or protein expression analysis (38, 52). PB-1, 2A, and 2B T cell lines were established from a patient with a progressive, cutaneous ALK− TCL (53, 54). Sez-4 cell line was derived from a patient with cutaneous T cell lymphoma in a leukemic phase (Sezary syndrome) (54). YT is a human NK cell line. MOLT4, MOLT13, and Jurkat were derived from patients with T cell lymphoblastic lymphoma/leukemia. The murine pro-B cell lymphoid cell line BaF3 was transfected with a vector containing NPM/ALK construct or a control empty vector (44). PBMC and PHA-stimulated blasts from healthy adults served as normal controls and were obtained by centrifugation on Ficoll/Paque gradient (54). Cell lines and PHA blasts were cultured at 37°C with 5% CO2 in standard RPMI 1640 medium supplemented with 10% heat-inactivated FBS, 1% penicillin/streptomycin/fungizone mixture, 2 mM l-glutamine, and, in the case of BaF3 cells, 10% IL-3 containing WEHI-conditioned medium (55). Tissue sections were obtained from a total of 10 patients. The patients varied in age from 1 to 16 years (median, 8.5), nine were males, and one was a female. All but one presented with lymphadenopathy, the remaining one with a s.c. mass in the thigh. All lymphomas showed anaplastic large cell morphology, usually a monomorphic variant type, and expressed CD30 and epithelial membrane Ags, but not CD15 Ag. In seven patients, T cell origin of the lymphoma was determined by a positive immunohistochemical staining for at least one T cell-associated marker (CD3, CD43, and/or CD45R0). None of the lymphomas expressed B cell-associated marker CD20. Expression of ALK protein was confirmed in all 10 cases by the immunohistochemistry. Formalin-fixed, paraffin-embedded tissue was available from eight patients, and cryopreserved, snap-frozen tissue was available from four patients, in two of whom the frozen tissue was the only specimen analyzed. NPM/ALK tyrosine kinase activity was examined using an ELISA-based protein tyrosine kinase assay kit (Sigma-Aldrich, St. Louis, MO) according to the manufacturer’s manual. Briefly, cells were lysed with lysis buffer (1% Nonidet P-40, 10% glycerol, 137 mM NaCl, 20 mM Tris (pH 7.4)) containing protease and phosphatase inhibitors (1 mM PMSF, 10 μg/ml aprotinin, 10 μg/ml leupeptin, 2 μg/ml pepstatin A, 2 mM sodium vanadate, 20 mM NaF). Immunoprecipitation with 4 μl of ALK goat polyclonal Ab (Santa Cruz Biotechnology, Santa Cruz, CA) and 20 μl of protein A-agarose (Life Technologies, Grand Island, NY) was performed. Immunoprecipitates were added to poly-Glu-Tyr substrate-coated wells. The plate was incubated for 30 min at room temperature in the presence of tyrosine kinase buffer (50 mM HEPES (pH 7.4), 20 mM MgCl2, 0.1 mM MnCl2, 0.2 mM Na3VO4, 0.3 mM ATP), washed, and incubated with a monoclonal anti-phosphotyrosine/peroxidase conjugate. After washing, solution containing peroxidase substrate was applied to the plate. The reaction was stopped by adding 2.5 N H2SO4, and activity was measured in a microplate ELISA reader. NPM/ALK tyrosine kinase activity was compared with activity of two different concentrations (2 U and 4 U) of a purified human epidermal growth factor receptor supplied by the kit’s manufacturer. These experiments were performed as described previously (54, 55, 56). In brief, the cells (5–10 × 106) under study were washed and lysed in ice-cold lysis buffer. In some experiments, the cells were exposed for 5 min to 500 U of IL-2 or medium alone before lysis. The cell lysates were centrifuged, and supernatants were precleared with protein A-Sepharose (Sigma-Ald-rich) and incubated with a primary Ab specific for ALK, Jak3, STAT 1–6, PP2A, or PIAS1/3 (all Abs from Santa Cruz Biotechnology) and protein A-Sepharose. In some experiments, Abs were preincubated with a specific inhibitory peptide (54). The immunoprecipitates were washed, boiled, separated on a 10% polyacrylamide-SDS gel, and transferred electrophoretically to hybridization transfer membranes. In some experiments, cell extracts were directly separated by electrophoresis without the preceding immunoprecipitation. The membranes were blocked with 2% BSA in the TBST buffer. To detect protein expression, the membranes were incubated with the same Abs that were used for immunoprecipitation. To detect protein association, combinations of the appropriate Abs were used (see Results). To detect protein phosphorylation, the membranes were incubated with the antiphosphotyrosine 4G10 Ab (Upstate Biotechnology, Lake Placid, NY) or Ab specific for STAT3 phosphorylated on tyrosine 705 (phospho-STAT3; Santa Cruz Biotechnology) or serine 727 (New England Biolabs, Beverly, MA). Next, the membranes were incubated with appropriate secondary, peroxidase-conjugated Abs. Blots were developed using the ECL chemiluminescence reagents (Amersham Pharmacia Biotech, Piscataway, NJ). Nuclei were isolated and extracted in lysis buffer comprised of 20 mM HEPES (pH 7.9), 25% glycerol, 420 mM NaCl, 1 μM antipain, 1 μM chymostatin, 1 μM leupeptin, 1 μM pepstatin, 1 mM PMSF, 0.1 μM aprotinin, 200 mM DTT, 20 mM MgCl2, and 5 mM EDTA. The oligonucleotide sequence of the STAT3 consensus binding site was as follows: 5′-GAT CCT TCT GGG AAT TCC TAG ATC-3′ (Santa Cruz Biotechnology). In addition, an oligonucleotide containing mutation in the STAT3 binding site, 5′-GAT CCT TCT GGG CCG TCC TAG ATC-3′, was used as a negative control. Binding reaction was performed in a total volume of 20 μl in 20 mM HEPES (pH 7.6), 1 mM EDTA, 10 mM (NH4)2SO4, 1 mM DTT, 30 mM KCl, and 0.2% Tween 20. Ten micrograms of nuclear protein were incubated for 15 min at room temperature with 1 μg of poly(dI-dC) and 30 fmol of digoxigenin (Boehringer Mannheim, Indianapolis, IN)-labeled oligo-DNA probe. The protein-DNA complexes were separated in the 6% nondenaturing acrylamide gels in 0.5× Tris-borate-EDTA buffer and were transferred electrophoretically to positively charged nylon membrane. The membrane was preincubated with blocking solution, incubated with Fab of antidigoxigenin Ab, and washed. Blots were developed using the CSPD system (Boehringer Mannheim). The staining was performed as described previously (56, 57) on formalin-fixed, paraffin-embedded, and cryopreserved tissue sections using a standard streptavidin-biotin complex technique (Research Genetics, Huntsville, AL) and Abs against the following Ags: ALK, CD3, CD15, CD20, CD43, CD45R0, CD30, and epithelial membrane Ag (all Abs from DAKO, Carpinteria, CA) and phosphotyrosine (705)-STAT3 (Cell Signaling Technology, Beverly, MA). To detect ALK expression, heat-induced Ag retrieval was performed using pH 6 citrate buffer and 10-min slide immersion into 95°C waterbath. Total cellular RNA was extracted by RNeasy kit (Qiagen, Valencia, CA). RT-PCR (56) was performed with 1 μg of total RNA in RT buffer mixture containing 200 U of SuperScript II reverse transcriptase (Life Technologies). RNase H (Promega, Madison, WI) was added and cDNA was purified on Centri-Sep columns (Princeton Separations, Princeton, NJ). PCR was performed with 2 μl of cDNA in a PCR buffer mixture containing 2 U of Taq polymerase (Life Technologies). The PIAS3-specific primers were designed based on the PIAS3 genomic DNA sequence from the GenBank database using an Oligo 4.0 computer program (National Biosciences, Plymouth, MN). The PCRwas performed at 94°C for 3′, followed by 30 cycles: 45 s at 94°C, 30 s at 57°C, and 1.5 min at 72°C. The amplified products were visualized in UV light by staining with ethidium bromide after electrophoresis in the 1.5% agarose gel. Several T cell lines carrying the t(2;5) translocation were established from patients with ALK+ TCL (38, 52). To investigate the expression and functional status of NPM/ALK fusion oncoprotein in such cell lines, we performed immunoprecipitation of the cell lysates with an anti-ALK Ab followed by Western blotting with, respectively, the anti-ALK Ab and an antiphosphotyrosine Ab. As shown in Fig. 1⇓A, the ALK+ T cell lymphoma cell lines JB6, SU-DHL1, and Karpas 299 expressed the NPM/ALK (80 kDa) protein, whereas the control PB-1 cell line derived from a t(2;5)-negative cutaneous T cell lymphoma (53, 54) did not express NPM/ALK or any other form of ALK. The expressed NPM/ALK was strongly phosphorylated on the tyrosine residues in all four ALK+ TCLs tested (Fig. 1⇓B), presumably due to autophosphorylation (41, 42). To show directly that the constitutively activated NPM/ALK displays tyrosine kinase activity, we examined the cell lysate immunoprecipitates obtained with the ALK Ab for in vitro tyrosine kinase activity, using a synthetic substrate rich in tyrosine residues. As shown in Fig. 1⇓C, NPM/ALK was constitutively enzymatically active in the ALK+ TCL cell lines. NPM/ALK oncoprotein is constitutively active in ALK+ TCL cells. 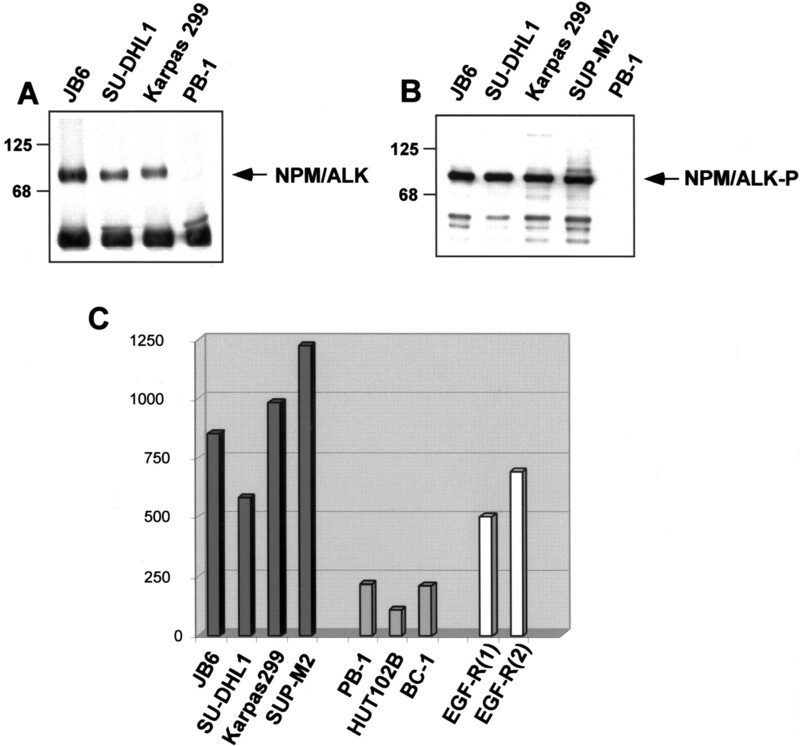 Four ALK+ TCL cell lines (JB6, SU-DHL1, Karpas299, and SUP-M2) were tested for expression (A) and tyrosine phosphorylation (B) of NPM/ALK by immunopreciptitation with an anti-ALK Ab followed by electrophoresis and immunoblotting with, respectively, anti-ALK and anti-phosphotyrosine Ab. 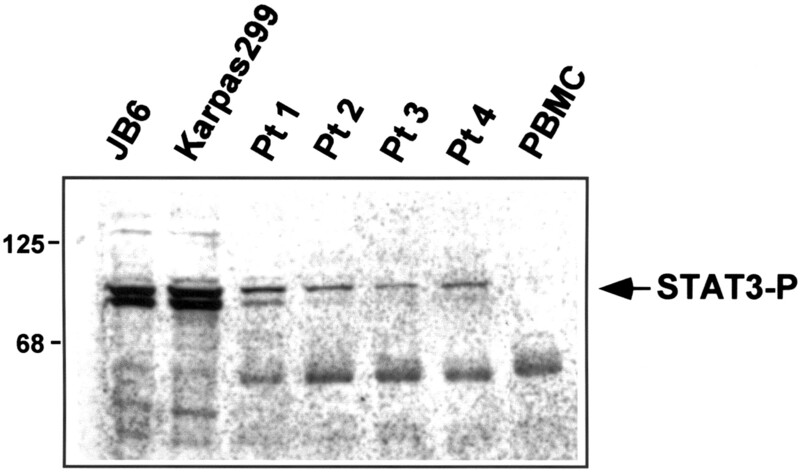 ALK− TCL cell line PB-1 served as a negative control. ALK in vitro kinase assay (C) was performed by cell lysate immunoprecipitation with the anti-ALK Ab followed by detection of phosphorylation of the tyrosine-rich synthetic peptide in ELISA. ALK− TCL cell lines (PB-1, HUT102B, and BC-1) served as negative controls; receptor for epidermal growth factor used at two different concentrations (EGF-R(1), 2 U; EGF-R(2), 4 U) served as a positive control. To determine whether the constitutively active NPM/ALK activates STATs, we examined the ALK+ TCL cell lines for tyrosine phosphorylation of these signaling proteins. At first, we concentrated on STAT3 and STAT5, which are perpetually activated as a consequence of constitutive activation of the IL-2R complex-associated Jak/STAT signaling pathway in the ALK−, human T cell leukemia virus-I-positive, and human T cell leukemia virus-I-negative T cell lines derived from cutaneous TCL involving skin (54, 56, 58, 59, 60, 61). As shown in Fig. 2⇓, A–C, STAT3, but not STAT5 a or b, was constitutively phosphorylated in all three ALK+ TCL cell lines tested. This activation appeared maximal because it could not be enhanced by cell treatment with IL-2. Interestingly, one of the lines, JB6, but not the other two lines, displayed constitutive phosphorylation of Jak3, suggesting that this tyrosine kinase may contribute to the constitutive activation of STAT3 in the JB6 line. To determine whether STATs other than STAT3 and STAT5 are activated in the ALK+ TCL cells, we examined the tyrosine phosphorylation status of an additional four known STATs (1, 2, 4, 6) in such cells. However, STAT3 was the only STAT that was consistently tyrosine phosphorylated in all four ALK+ TCL cell lines tested (Fig. 2⇓D and data not shown). From the other STATs, only STAT1 was phosphorylated in two ALK+ TCL cell lines, JB6 and SUP-M2. These findings indicate that the STAT3 activation is rather selective in the ALK+ TCL cells. STAT3 is continuously and selectively activated in ALK+ TCL cells. Cell lysates from ALK+ T cell lymphoma lines were immunoprecipitated with anti-Jak3 and anti-STAT3α and -STAT5α/β Abs in the first set of experiments (A–C) and with anti-STAT1-STAT6 Abs in the second set of experiments (D, a representative result). The electrophoretically separated immunoprecipitates were immunoblotted with an anti-phosphotyrosine Ab. Next, the whole cell lysates were immunoblotted with an anti-phospho-STAT3α/β (E). ALK− TCL cell lines PB-1 and 2B, which express continuously activated STAT3 as a part of the IL-2R Jak/STAT signaling pathway, were also evaluated. Finally, capacity of STAT3 to bind DNA was determined in EMSA (F). Nuclear extracts from the ALK+ TCL cell lines were exposed to digoxigenin-labeled STAT3-specific oligo-DNA fragments, either wild-type or mutated (m) at the STAT3 binding site. ALK− TCL cell line 2B and NK cell line YT that express activated STAT3 served as positive controls, whereas the Sezary Syndrome-derived Sez-4 cell line that expresses nonactivated STAT3 served as a negative control. Recent studies have demonstrated that STAT3 exists in two highly related forms that differ in their gel migration pattern (60). The slow migrating form (STAT3α) contains the full-length molecule (91 kDa), whereas the fast migrating form (STAT3β) is slightly smaller due to truncation of the carboxyl terminus domain. STAT3α is considered biologically more active (60). Because the standard anti-STAT3 Ab that we used in the experiments described in Fig. 2⇑, A–D, recognized only STAT3α, we used in this experiment a novel Ab specific for phospho-STAT3 and reactive with both STAT3 forms to determine which of them is preferentially phosphorylated in the ALK+ TCL cells. This anti-phospho-STAT3 Ab recognizes specifically STAT3 phosphorylated on tyrosine 705, phosphorylation of which is critical for an effective STAT3 activation. As shown in Fig. 2⇑E, both α and β forms of STAT3 were strongly tyrosine phosphorylated. This contrasted with the ALK− cutaneous TCL cell lines, which displayed preferential phosphorylation of STAT3α. To provide further evidence that STAT3 is continuously activated in ALK+ TCL cells, we tested the ability of STAT3 derived from such cells to specifically bind DNA. As shown in Fig. 2⇑F, STAT3 derived from four different ALK+ TCL cell lines bound the STAT3 target oligo-DNA sequence. The binding was, indeed, sequence specific, as demonstrated by lack of STAT3 binding to a mutated form of the target oligo-DNA that did not contain the consensus binding site for STAT3 due to a three-base substitution. To determine whether STAT3 activation is present not only in the cultured ALK+ TCL cell lines, but also in ALK+ TCL cells derived directly from patients, we examined by Western blotting and immunohistochemistry activation status of STAT3 in lymphoma tissue samples from 10 patients with ALK+ TCL, using the anti-phospho-STAT3 Ab. As shown in Fig. 3⇓, cells from all four ALK+ TCL patients tested in Western blot displayed tyrosine phosphorylation of STAT3. Interestingly, in contrast to the ALK+ TCL cell lines, the lymphoma tissues from most (3 of 4) patients displayed preferential phosphorylation of the α form of STAT3 (60). Whether this discrepancy reflects a true difference between the cultured and tissue-derived lymphoma cells or is related to some degree of contamination of the lymphoma cell by reactive, nonmalignant cells, which may be expected to preferentially activate STAT3 α (62), is at present unclear. To confirm that STAT3 is indeed continuously activated in ALK+ TCL cells in vivo, we examined by immunohistochemistry tissue sections from eight ALK+ TCL patients for in situ expression of phospho-STAT3. 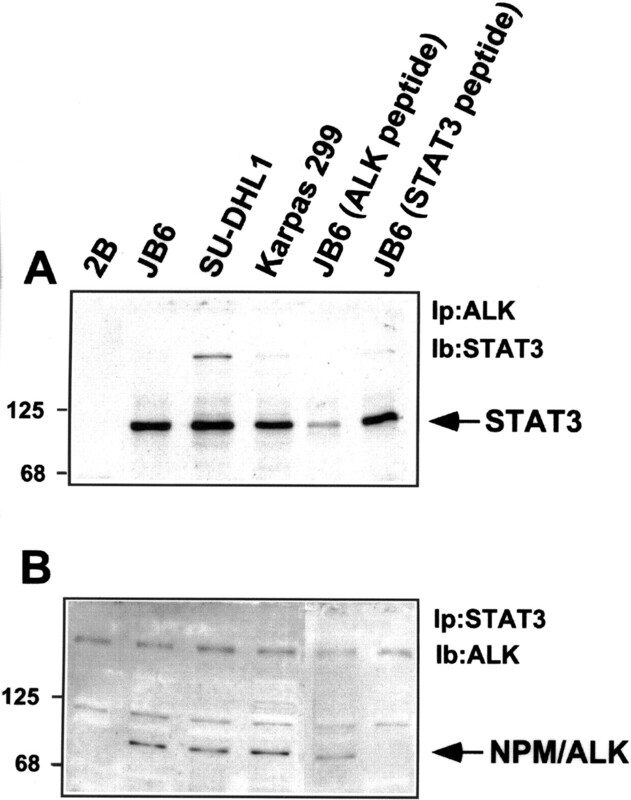 STAT3 is tyrosine phosphorylated in ALK+ TCL tissues (Western blot analysis). Cell lysates from lymph nodes involved by ALK+ TCL obtained from four patients (1–4) were evaluated in Western blot using an anti-phospho-STAT3α/β Ab. ALK+ TCL cell lines (JB6 and Karpas 299) and PBMCs from a healthy donor served as a positive and negative control, respectively. Fig. 4⇓ depicts results of such analysis in a patient representative for the entire cohort. H&E-stained sections (left two panels) show a diffuse infiltrate of large, anaplastic lymphoma cells involving the lymph node parenchyma and packing the marginal sinus. ALK staining highlights the large lymphoma cells and shows lack of staining in the small, reactive lymphocytes. Staining with the phospho-STAT 3 Ab shows an architectural pattern very similar to the ALK staining, with the most intense staining of the lymphoma cells in the marginal sinus and lack of staining of the scattered reactive lymphocytes. The same results were obtained in all eight patients examined, including two also tested by Western blot (Fig. 3⇑). These findings indicate that ALK expression is invariably associated with activation of STAT3, not only in cultured but also in primary lymphoma cells, and strongly suggest that ALK mediates STAT3 activation. STAT3 is tyrosine phosphorylated in ALK+ TCL tissues (immunohistochemical analysis). Upper left and lower left, Histology of a representative case. Middle panels, Staining with an anti-ALK Ab. Right panels, Staining with the anti-phospho-STAT3 Ab. The images represent low power (×100) and high power (×600) magnifications. The depicted results are representative for eight ALK+ TCL cases. To provide a direct evidence that NPM/ALK mediates activation of STAT3, we evaluated STAT3 tyrosine phosphorylation in a lymphoid BaF3 cell line transfected with NPM/ALK (44) or an empty vector. As shown in Fig. 5⇓, constitutive expression of NPM/ALK did, indeed, result in phosphorylation of STAT3. The STAT3 phosphorylation was not related to an increase in the STAT3 expression because the NPM/ALK and vector-transfected cells expressed similar amounts of STAT3 (Fig. 5⇓C). Interestingly, the β but not the α form of STAT3 was phosphorylated in the BaF3 cells (Fig. 5⇓B). The reason for the difference in the STAT3 phosphorylation pattern seen between the ALK+ TCL (Figs. 2⇑ and 3⇑) and BaF3 cells is unclear. However, it may be related to the ontogenetic differences between these two cell populations (human mature T cell lymphoma cells vs murine immature, pro-B cell leukemic cells). STAT3 activation is mediated by NPM/ALK. 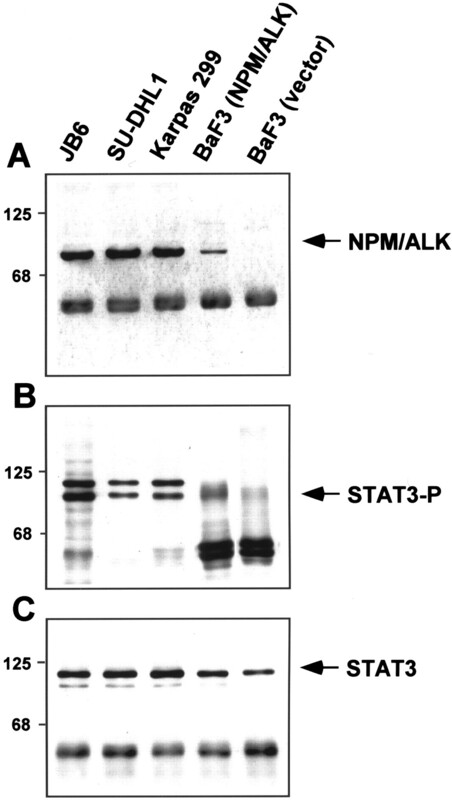 Cell lysates of BaF3 cells transfected with either NPM/ALK gene construct or empty vector were examined by immunoblotting for expression of NPM/ALK (A), phospho-STAT3α/β (B), and total STAT3α (C). ALK+ TCL cell lines served as positive controls. To determine whether NPM/ALK associates with STAT3 we performed coprecipitation experiments using ALK and STAT3 Abs (Fig. 6⇓). Western blotting of the ALK immunoprecipitates with the STAT3α-reactive Ab yielded a strong STAT3 band (91 kDa). Pretreatment of the ALK Ab with a specific blocking peptide greatly diminished intensity of the band (Fig. 6⇓A, lane 4), whereas pretreatment of the ALK Ab with the STAT3 Ab-specific blocking peptide had no effect on the band intensity (Fig. 6⇓A, lane 5), confirming specificity of the reaction. The reciprocal immunoprecipitation with the STAT3 Ab followed by immunoblotting with the ALK Ab yielded a dominant, NPM/ALK (80 kDa) band, the intensity of which was not affected by preincubation of the STAT3 Ab with the ALK inhibitory peptide, but was eliminated by preincubation with the STAT3 peptide (Fig. 6⇓B). As expected, precipitation with the anti- ALK Ab of cell lysate from the ALK− TCL cell line 2B (53, 54) did not coprecipitate STAT3 (Fig. 6⇓A), and the converse experiment with the anti-STAT3 Ab precipitation followed by anti-ALK Ab blotting also did not yield an ALK-specific band (Fig. 6⇓B). These data strongly suggest that STAT3 is activated directly by NPM/ALK. STAT3 is associated with NPM/ALK. Cell lysates from ALK+ TCL cell lines and control ALK− TCL 2B cell line were immunoprecipitated with anti-ALK or anti-STAT3α Ab, electrophoresed, and immunoblotted with the reciprocal Ab (anti-STAT3α (A) and anti-ALK (B)). Oligopeptides specific for the anti-ALK and anti-STAT3α Abs (lanes 4 and 5, respectively) were used as controls. Recent findings indicate that PP2A phosphatase is involved in the maintenance of perpetual STAT3 tyrosine phosphorylation in ALK− cutaneous TCL cell lines that are mediated by constitutive activation of the Jak3 kinase (50). The exact mechanism of this enhancement is unclear, but may be related to the PP2A-induced serine/theonine dephosphorylation of STAT3 (50). To determine whether PP2A also plays a role in the continuous tyrosine phosphorylation of STAT3 mediated by NPM/ALK, we examined the ALK+ TCL cell lines for expression and functional status of this phosphatase. As shown in Fig. 7⇓A, all four ALK+ TCL cell lines expressed PP2A. Moreover, we found that PP2A was associated with STAT3 (Fig. 7⇓B). To evaluate whether the expressed PP2A participates in the perpetual STAT3 tyrosine phosphorylation, we treated the ALK+ TCL cell lines with the PP2A inhibitor calyculin A (50). This treatment resulted in an almost complete eradication of the STAT3 phosphorylation in all cell lines (Fig. 7⇓C). In only one cell line, SUP-M2, phosphorylation of the fast migrating form of STAT3 remained unaffected; the slow migrating form in this cell line and the fast and slow migrating forms in the remaining three cell lines became completely tyrosine dephosphorylated. As expected, the expression of STAT3 was not affected by the treatment with calyculin A (Fig. 7⇓D). These findings indicate that PP2A plays a critical role in maintaining constitutive tyrosine phosphorylation of STAT3 in the NPM/ALK+ TCL cells. PP2A phosphatase supports tyrosine phosphorylation of STAT3 in ALK+ TCL cells. A and B, Association of PP2A and STAT3. Cell lysates from ALK+ T cell lymphoma lines were analyzed by immunoprecipitation with anti-PP2A Ab followed by immunoblotting with Ab against either PP2A (A; expression control) or STAT3α (B). C and D, Functional inactivation of PP2A suppresses STAT3 tyrosine phosphorylation. ALK+ TCL cells were precultured in the presence or absence of the PP2A inhibitor calyculin A, lysed, and analyzed in Western blotting by a phospho-STAT3α/β Ab (C). 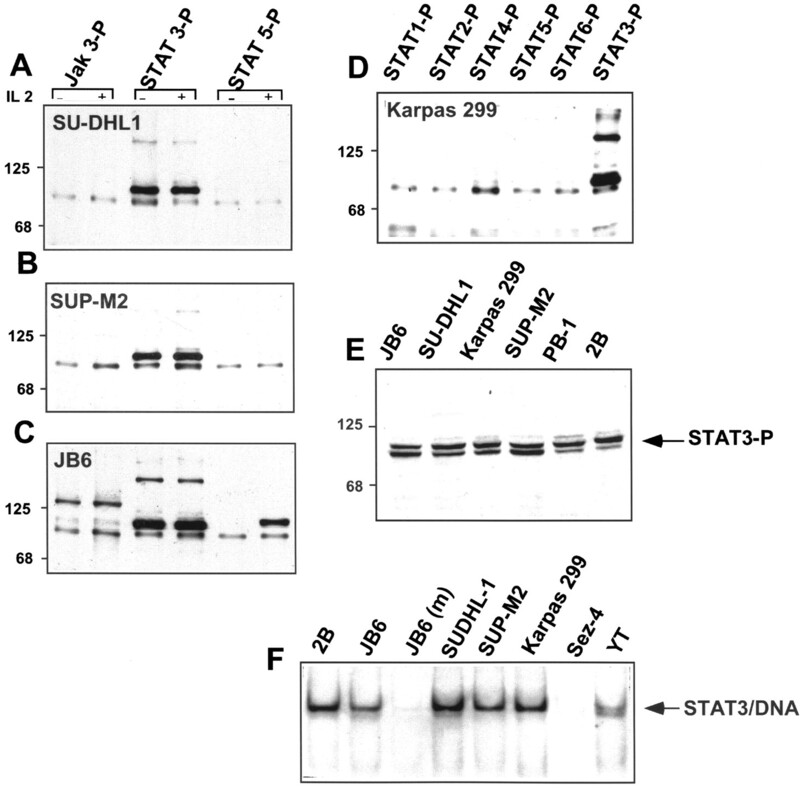 After stripping, the blot was reprobed with anti-STAT3 Ab (D). Tyrosine phosphorylation of NPM/ALK remained unaffected by cell pretreatment with calyculin A (data not shown). Recently, an inhibitor of STAT3 activation called PIAS3 has been described (51). PIAS3 belongs to a novel family of inhibitors, members of which are ubiquitously expressed and act by direct binding to STATs, preventing them from binding to DNA (49, 51). It appears that PIAS proteins are highly specific in their interaction with STATs because PIAS3 binds to STAT3 but not STAT1 (51), and, in turn, STAT1 comprises a target for PIAS1 but not for PIAS3 (63). To determine whether dysregulation of PIAS expression may contribute to the constitutive STAT3 activation induced by NPM/ALK, we evaluated ALK+ TCL cell lines for expression of PIAS3 and PIAS1 on both RNA and protein levels. In contrast to the control normal T cell-rich PBMC- and PHA-stimulated T cell blasts, three of four ALK+ T cell lines tested failed to express mRNA coding for PIAS3. This lack of PIAS3 mRNA expression was not limited to the ALK+ T cell lymphoma lines, because most (two of three) ALK− cutaneous TCL lymphoma lines, which display constitutive STAT3 activation mediated by Jak3 (Fig. 2⇑) (54), also failed to express PIAS3 transcript. It is noteworthy that three other ALK− T cell lines derived from T cell lymphoblastic lymphoma/leukemia, in which STAT3 is in the quiescent tyrosine-nonphosphorylated state (59, 61), expressed the transcript. To examine whether the TCL cell lines that expressed PIAS3 mRNA contained PIAS3 protein, we performed a Western blot analysis on some of these T cell lines using an Ab that recognizes both PIAS3 and PIAS1. As can be seen in Fig. 8⇓C, no PIAS3 protein (molecular mass, 68 kDa) could be detected in the phospho-STAT3+ TCL lines, including the two PIAS3 mRNA. PIAS3 expression was identified in the control PBMC, PHA-blasts and the T cell lymphoblastic lymphoma/leukemia cell line MOLT4 which, as stated above, does not display constitutive activation of STAT3 (54, 61). In contrast to PIAS3, all normal and malignant cell populations, including the ALK+ TCL cell lines, expressed PIAS1 (molecular mass, 78 kDa). These findings indicate that loss of PIAS3 expression in the ALK+ and other TCL cells is frequent, apparently selective, and may be due to disruption of PIAS3 protein synthesis on both pre- and posttranscriptional levels. Lack of PIAS3 expression in ALK+ TCL cells. A, Detection of PIAS3 mRNA expression by RT-PCR. RNA isolated from ALK+ and ALK− TCL cell lines, PBMCs, and PHA-stimulated blasts (PHAbl) was reverse-transcribed; the resulting cDNA was PCR amplified using PIAS3-specific primers. 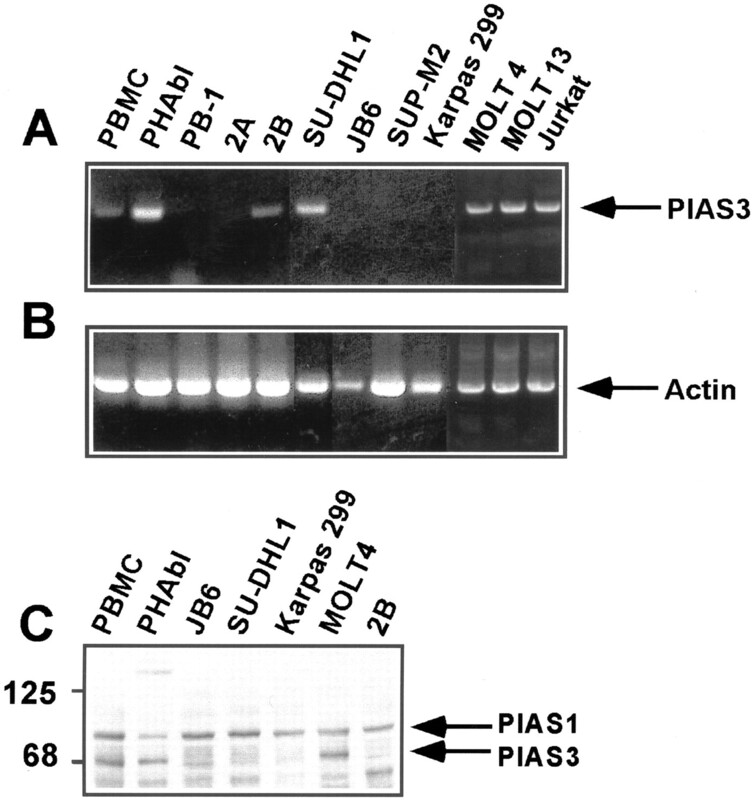 PCR amplification of the cDNA using actin-specific primers served as a positive control (B). C, Detection of PIAS3 protein expression. Cell lysates were analyzed in Western blotting using an PIAS Ab reactive with PIAS3 (molecular mass, 68 kDa) and PIAS1 (molecular mass, 78 kDa). Tyrosine kinases play a critical role in cell proliferation, survival, and maturation by regulating ligand-mediated signal transduction and cell cycle progression (reviewed in Refs. 64, 65, 66). Chromosomal translocations involving genes coding for some of such kinases result in their constitutive ectopic expression, oligomerization, autophosphorylation, and activation, which consequently leads to malignant transformation of the affected cells (64, 65, 66, 67, 68). 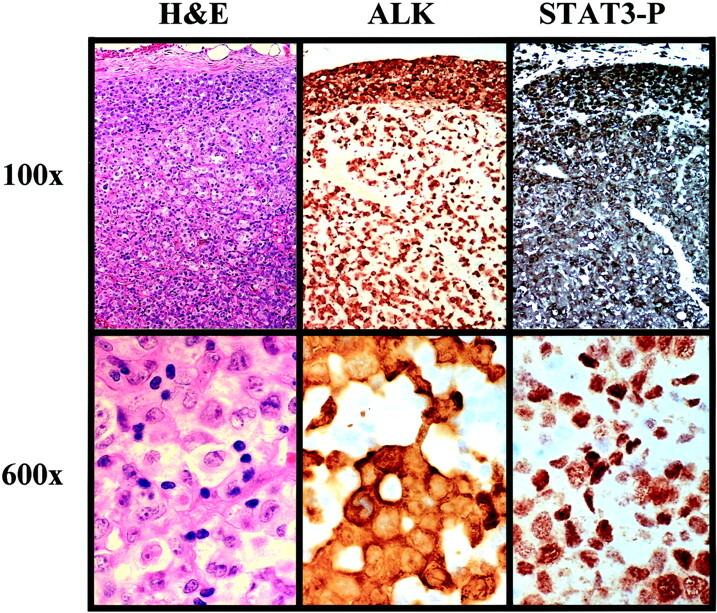 Identification of the ectopic expression of ALK, most often as the NPM/ALK hybrid protein, in the subset of non-Hodgkin’s lymphoma resulted in recognition of ALK+ TCL as a distinct clinicopathological entity (1, 2, 3) and created an opportunity for development of novel therapies aimed at suppression of the effects of the ALK-mediated cell transformation (46). It could be argued that inhibition of the ALK tyrosine kinase activity by a yet to be developed specific inhibitor (64, 65, 67, 68) may represent the optimal future therapy for ALK+ TCL. Accordingly, a novel kinase inhibitor, STI 57148, which is relatively specific for bcr/abl oncoprotein (69, 70), has proven effective as a single agent in treatment of chronic myelogeneous leukemia (71, 72). However, administration of STI 57148 alone may frequently be insufficient, particularly when used in the acute leukemic forms of the bcr/abl+ malignant disorders (73, 74, 75), which bear more resemblance to ALK+ TCL than the chronic myelogeneous leukemia in regard to their natural course. Therefore, combined therapy targeting ALK and the molecule(s) downstream of ALK might represent the most effective treatment for ALK+ TCL. Little is known so far about the cell signaling pathways activated by ALK in normal and malignant cells. Previous studies have shown a direct interaction of NPM/ALK with Shc and insulin receptor substrate-1 (41, 42), raising a possibility that these adapter proteins may play a role in ALK-mediated lymphomagenesis. However, interaction of both Shc and insulin receptor substrate-1 may not be essential for NPM/ALK-mediated cell transformation (41, 76). The potential role of another adapter molecule, GRB2, in such a process is also controversial (41, 46). Furthermore, phospholipase C-γ has been identified as a major downstream target of NPM/ALK (76). Activation of phospholipase C-γ, which in normal cells leads to the generation of diacylglycerol and inositol triphosphate, activation of protein kinase C, and calcium mobilization may play a role in the NPM/ALK-mediated oncogenesis by transducing mitogenic signals (76). Recently, we (77) and others (78) have found that NPM/ALK also activates the phosphatidylinositol 3-kinase/AKT signaling pathway. In this report, we provide several lines of evidence that constitutively active NPM/ALK mediates continuous activation of STAT3. Strong tyrosine phosphorylation of STAT3 was present in NPM/ALK+ cultured, tissue-based, and transfected cells. In the ALK+ TCL cell lines, we also confirmed STAT3 activation by the DNA binding assay. Activation of STAT3 was selective because no other STAT protein was consistently activated in any of the ALK+ TCL cell lines. STAT3 seemed to be activated directly by NPM/ALK, as shown by bidirectional NPM/ALK-STAT3 coprecipitation. It is well established that activation of STAT3 plays a critical role in development and function of normal hematopoietic and nonhematopoietic cells (reviewed in Refs. 79 and 80). Although the final net effect of STAT3 activation appears to depend on the contribution of other costimulatory molecules and type and stage of differentiation of the affected cell, STAT3 displays mitogenic and antiapoptotic properties in at least some types of cells. Not surprisingly, there is a growing body of evidence that STAT3 may play an important role in pathogenesis of a broad spectrum of malignant tumors (79, 80). In regard to T cell malignancies, STAT3 is continuously activated in T cell lines derived mainly from adult-type T cell lymphoma/leukemia (58, 59, 61) and cutaneous T cell lymphoma/Sezary syndrome (54, 60). STAT3 activation in such cell lines results from a constitutive activation of the Jak/STAT signaling pathway associated with the common γ-chain (γc) that is shared by receptors for IL-2, IL-4, IL-7, IL-9, and IL-15 (48). It is noteworthy that in a set of three cell lines from a patient with cutaneous T cell lymphoma, activation of STAT3 was highly selective, although dependent on the signaling mediated by the γc-associated Jak3 kinase (60). This finding, combined with the data presented in this report, indicates that activation of STAT3 may be important in the pathogenesis of several types of T cell lymphoma. Furthermore, it suggests that NPM/ALK might use the critical part(s) of the γc-associated signaling pathways. In addition to NPM/ALK, several other oncogenic kinases such as v-src, v-fps, and v-sis activate STAT3 in a direct and indirect manner (79, 80). This may explain the presence of activated STAT3 and other STATs in various types of human tumors, including carcinomas that involve breast, head and neck, and lung. Activation of STAT3 appears critical for cell transformation mediated by v-src (81, 82); the exact role of STAT3 in tumorigenesis mediated by the other oncogenic kinases including NPM/ALK remains to be elucidated. It is noteworthy that activated STAT3 has recently been shown to be directly oncogenic in vitro and in vivo in fibroblast transformation models (83, 84). On the functional level, constitutive activation of STAT3 in malignant cells mediates resistance to apoptosis (85, 86, 87). Under physiologic conditions, activation of STATs is only transient due to inhibition of their activity by negative regulators, both direct and indirect (49, 80). Our data indicate that dysregulation of STAT3 activation in ALK+ TCL may be complex and not dependent solely on the continuous phosphorylation mediated by NPM/ALK, but also involving at least two other regulatory molecules: PP2A phosphatase and PIAS3. PP2A, which binds to STAT3, is required for the sustained tyrosine phosphorylation and activation of STAT3 in cutaneous T cell lymphoma (50) and, as shown here, ALK+ TCL (Fig. 7⇑). However, the mechanism of up-regulation of the STAT3 activity by PP2A is currently poorly understood. It could be argued that the enhancing effect of PP2A results from its suppression of STAT3 phosphorylation on serines and threonines (50). However, the prevailing evidence indicates that serine/threonine phosphorylation of STATs enhances rather than decreases activation of STAT3 mediated by tyrosine phosphorylation (79, 80). Furthermore, inhibition of PP2A activity by calyculin A resulted in ALK+ TCL cells in only a slight increase in the STAT3 serine phosphorylation (data not shown) that was disproportionately low when compared with the profound inhibition of the STAT3 tyrosine phosphorylation. Therefore, it is possible that PP2A may inhibit function of a currently unknown tyrosine phosphatase normally involved in dephosphorylation of STAT3 tyrosines. In addition to expressing activated PP2A, ALK+ TCL cells failed to express PIAS3 that is a potent direct negative regulator of STAT3 activity in normal cells by preventing its binding to DNA (51). The aberrant lack of PIAS3 expression seemed selective in ALK+ TCL because expression of PIAS1 that is a negative regulator of STAT1, but not STAT3 (63), was not diminished in such cells. Based on these data, we propose a model of a multifactoral control of STAT3 activation in ALK+ TCL (Fig. 9⇓). According to this model, constitutively active NPM/ALK continuously induces tyrosine phosphorylation of STAT3. This STAT3 phosphorylation is sustained by PP2A, which inhibits the tyrosine dephophorylation. The phosphorylated STAT3 can freely bind DNA without any interference by PIAS3 that is not expressed in ALK+ TCL cells. This multifactoral dysregulation of the STAT3 activation is, according to our knowledge, quite novel, and its existence has a number of important implications. First, it suggests that similar complex dysregulation might govern activation of STAT3 and similar proteins in other malignant tumors. Second, it raises a question of whether aberrant function of PP2A and lack of expression of PIAS3 are mediated by NPM/ALK or represent additional, NPM/ALK-independent oncogenic mechanisms. Recent evidence, which indicates that NPM/ALK expression alone may not be sufficient to mediate malignant cell transformation (88), indirectly supports the latter possibility. However, activation status of NPM/ALK, STAT3, and other NPM/ALK down-stream effector molecules, not to mention expression of PIAS3 and activation of PP2A, were not evaluated in that study. Therefore, further studies are needed to better understand ALK-induced oncogenicity and the exact role of STAT3 and its regulatory molecules in the pathogenesis of ALK+ TCL. Finally, our findings provide argument for combined therapy in ALK+ TCL possibly aimed at direct inhibition of ALK activity and abrogation of its effects indirectly by targeting downstream effectors and their regulatory proteins. Schematic model for regulation of the continuous STAT3 activation in ALK+ TCL. Constitutively active NPM/ALK continuously phosphorylates STAT3 on tyrosines. 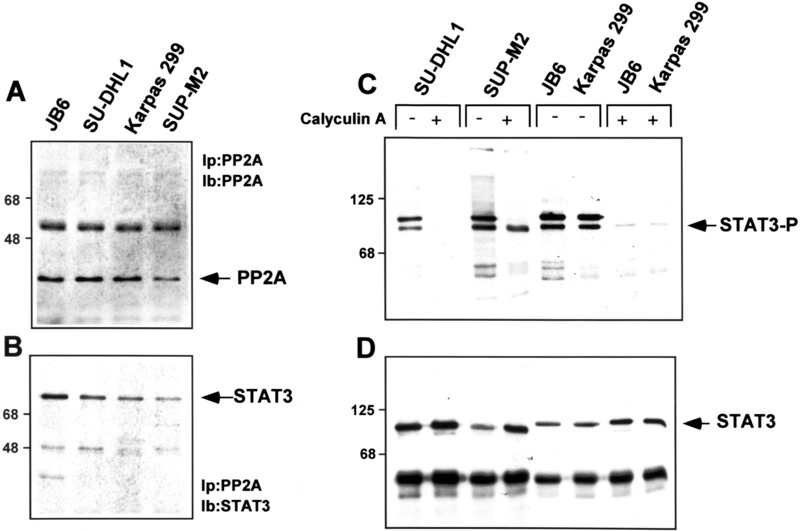 PP2A phosphatase is associated with STAT3 and prevents its tyrosine dephosphorylation. Failure to express by the ALK+ TCL cells of the STAT3 inhibitor PIAS3 permits the phosphorylated STAT3 to remain in the functionally active DNA-bound form. ↵1 This work was supported in part by National Cancer Institute Grant CA89194 (to M.A.W.) and American Cancer Society Grant RPG9834601LBC (to T.S.). M.A.W. is a recipient of the National Cancer Institute Shannon Award and T.S. is a Scholar of the Leukemia and Lymphoma Society. ↵3 Abbreviations used in this paper: ALK, anaplastic lymphoma kinase; TCL, T/null-cell lymphoma; NPM, nucleophosmin; PP2A, protein phosphatase A2; PIAS3, protein inhibitor of activated STAT3; γc, common γ-chain.